Attorney Charles D. Pittman Jr. has been helping residents and businesses in the City of Virginia Beach and throughout Virginia with their real estate transactions since 1981. From land development to foreclosure prevention via loan modifications, short sales, and other legal tools, Real Estate Legal Services is ready to provide advice and counsel on all types of real estate transactions. 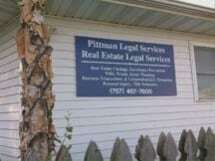 In recent years, The Law Office of Charles D. Pittman, Jr. and Associates, P.C. has helped hundreds of Virginia homeowners avoid foreclosure through renegotiating loans and short sales (the house is sold for less than what is owed on it). Some short sales included million-dollar homes burdened with multiple liens. Real Estate Legal Services may also use deeds in lieu of foreclosure (the borrower signs the deed for the property over to the mortgage holder). Charles Pittman, Jr. graduated from the University of Virginia with distinction in 1978, received his Juris Doctor from the Marshall Wythe School of Law at The College of William and Mary, and was admitted to the Virginia bar in 1981. As a real estate lawyer, he wants to protect his clients. He understands contract law, title law, bankruptcy law and creditor's rights and he knows how to deal with banks and government agencies. Charlie has served as an adjunct professor at the Regent University School of Law, teaching real estate transactions. Charlie and his team of short sale experts, dubbed the "Department of Distress Relief", frequently conduct seminars and lectures to educate the public and other real estate professionals on the ever-changing laws dealing with foreclosure and foreclosure alternatives. The law firm is located at 712 Hillingdon Court in Virginia Beach, near interstates 264 and 64, with ample parking, first-floor conference rooms, just five minutes from Town Center. Spanish speaking services are available. The office is open Monday through Friday from 9 a.m. to 5 p.m. Saturday and evening appointments are available upon request. Call 757-467-7600 for an appointment. If you're facing a mortgage default, the worst thing you can do is nothing. When you are facing a foreclosure situation, an experienced legal advocate can level the playing field in a homeowner's battle to get relief from oppressively high mortgage payments. There are a number of items that need to be considered when considering business law matters. Our firm can help with sole proprietorships, general partnerships, corporations, limited partnerships and limited liability companies. Our real estate attorneys provide services to clients involved in commercial and residential real estate transaction matters. We can provide an array of real estate services. Basic estate planning is crucial to ensure that minor children are provided for and raised by guardians selected by their parents in the event of an untimely death. If you do not act, these decision can be left in the hands of other people.